In the end of December 1872 troops under the command of Lt. Col. George Crook defeated Apaches warriors. 75 Apache were killed and the majority of the Apache surrendered at Camp Verde Arizona. Some continued to fight until they were nearly annihilated. 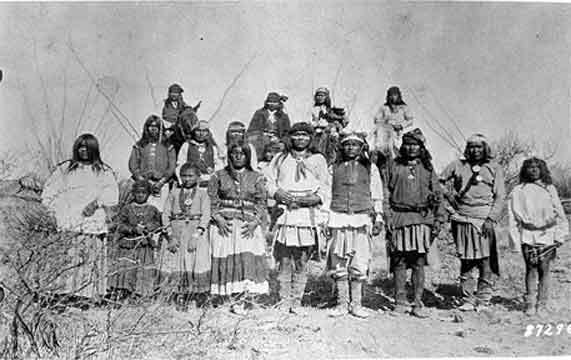 The Yavapal War which was also known as the Tonto War began in 1871 in what was known as the Grant Massacre on April 28, 1871. Then 150 Pinai and Aravaipa Apaches were killed by O’odham warriors and American settlers. The survivors fled north to seek help from the Yavapai and Tonto. Lieutenant Colonel Crook led a campaign to force the Natives back to the reservation. On December 28, 1872 Crooks men found the Yavapai in a stronghold in a cave known as the Skull of Skeleton Cave in the Salt River Canyon. The army surrounded the cave and surprised the Yavapai as the emerged from the cave. The army soldiers began fire into the cave and throwing rocks into the cave. After the brief one sided battle 76 Native Americans including women and children were found dead. A few weeks later Creeks men had another victory at Turret Peak. The Yavapai soon made peace at Camp Verde in 1973.